Circuit breakers are easily switched on and off which can cause problems for professionals carrying out an intervention. Shocks and extreme injury can be the results of prematurely reactivating a circuit. To avoid these accidents, and to enable safer machine interventions, Brady Corporation offers a circuit breaker lockout solution that is easy to apply. The new Universal Mini Circuit Breaker Lockout from Brady is easy to apply to a wide range of circuit breakers from various manufacturers. The small device is applied on a circuit breaker's switch and fastened using an attached screw that is easy to handle. Fastening the screw pushes out a hole for a Lockout/Tagout padlock shackle. Locking the padlock will lock the circuit breaker's switch in place to enable safer interventions. 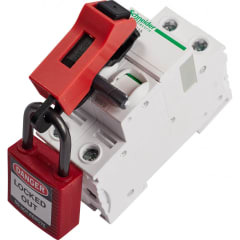 By locking out circuit breakers with a padlock, accidents can be avoided that are related to prematurely and inadvertently reactivated machinery and other electrical devices. Once the padlock is locked in place, only the professional who locked it, and who is carrying out the intervention, controls when the circuit breaker will be reactivated. As a back up, Brady can include master keys for supervisors selected in a Lockout/Tagout padlock key plan. With a solution to lock out circuit breakers, companies can increase compliance with the European Norm 1037 on equipment safety, and with the EU Guideline 89/655 that specifies minimum safety and health requirements at work. Find out more about safer machine interventions on the Brady website.